Science in General Biology and Psychology. 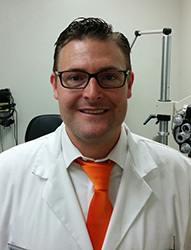 He received his Doctor of Optometry from University of California, Berkeley and is certified in the diagnosis and treatment of glaucoma, graduating as part of Beta Sigma Kappa honors society and as a nominee for the Grossman and Scaief patient management award. Dr. Miller spends his time off with his wife and two children. When he is not running around to his kids extra curricular activities or refereeing soccer games, he likes to take the family hiking around the bay and Tahoe. For daily relaxation he takes walks and gardens.